Here is a sensitive, thoughtful account of how her fascinating new book came to be by authoress Sunila Galiappatti. The book, A Long ‘Watch: The Capture of Commander Boyagoda, was recently released by Hurst, my own publishers in London. This article itself was originally published in The Wire. LTTE leaders at Sirumalai camp, Tamil Nadu, in 1984 while being trained by Indian Intelligence (RAW). 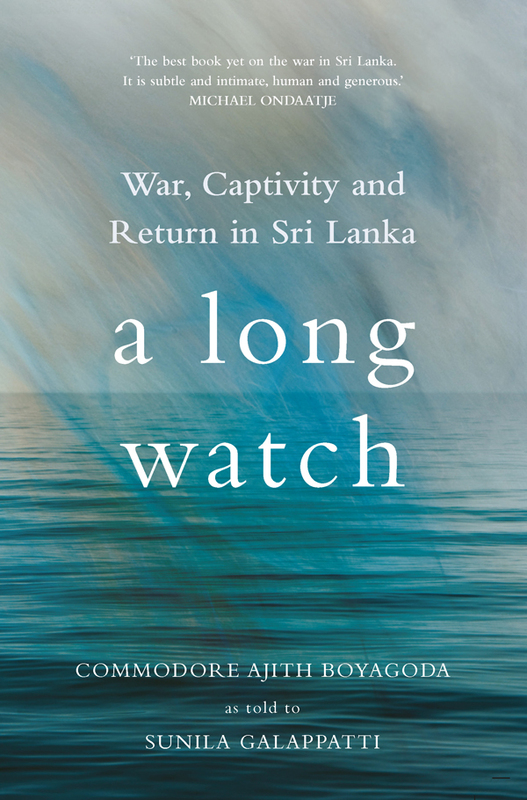 Credit: Wikimedia CommonsThe framing of A Long Watch: War, Captivity and Return in Sri Lanka (Hurst, 2016) the memoir of the LTTE’s highest-ranking prisoner, Commodore Ajith Boyagoda, as told to authoress Sunila Galappatti. This acceptance is the most surprising thing about the story and, almost immediately, people ask, “Did he go Stockholm?” I tell them it is a joke the commodore makes. “Maybe I have Stockholm syndrome,” he will say, and laugh. How is he to know, or I? We are not able to make a diagnosis, any more than the people who ask the question. But over time I have wondered why this particular question recurs, of so many possible questions. There is inside it an urge to know – to be able to identify as something we recognise, a story that doesn’t fit the format we expect. There is a suggestion that we might know better than the man who is telling us his story. We are quick to make an illness of his survival strategies. Above all, we are schooled to resist the story being told. I once asked similar questions. Five years ago, I was told there was this man. He had been an officer of the Sri Lankan navy who was captured and held for eight years by the separatist Liberation Tigers of Tamil Eelam (LTTE), during the middle decade of the island’s long civil war. He wanted to tell his story; might I be interested in working on it with him? I was interested but cautious; I felt I had to know more about the commodore’s politics first. I am embarrassed now by the arrogance of this reserve, but I do not want to belittle it. I knew the story must be fundamentally personal to Commodore Boyagoda, as the war itself is personal to all of us associated with Sri Lanka. If the commodore’s feelings about the war and mine were opposite, we might struggle to work together. I hope unlikelier collaborations will indeed be forged, but I was not there yet. It was a question of what was possible in that time and place. “You come back and you want to go to the toilet and you look around for someone to ask. You can go insane,” he said. What struck me most of all was the understated way that Commodore Boyagoda spoke. He told me that in one of the places he was held, the prisoners were “quite free”; meaning that they were not held in chains and could move around three rooms of a house, as long as they did not speak to each other or try to go outdoors. It was apparent to me that he was speaking from within his reality, not ours. Occasionally, when he was moved at night, without blindfolds, he used his naval training to navigate by the stars. In his cell, he tried to work out the progress of a battle: from which direction were the shells coming? In which direction did ambulances travel afterwards? Ten years later, his memory of captivity served in turn as a prompt for piecing together the progress of war. None of this was told to me with the drama we perceive in it, but rather with a forceful pragmatism. I knew that that was precisely the tone and plain language in which I had to write the book, if it was to be a faithful account. This instinct was reinforced by an everyday conversation I had sometime later – completely unrelated to the commodore’s story. I had moved for a short time to the east coast of Sri Lanka and had just found a room to rent. I went with my brother to pay a customary courtesy call on my landlord. It went as these conversations go. The landlord kindly offered us a cup of tea and introduced us to his mother-in-law. We spoke of our family to reassure him of our values and respectability. He spoke of his family and told us his son was just visiting from university in the US. This reminded him of his own travels as a young man: he recollected that time and, to account for it, mentioned that his sister had worked for an airline, enabling his travel. Then he said, “But she was taken by the LTTE in 1990 and we haven’t seen her since.” He did not need to explain and I imagine one could not, easily. He was speaking from within context and expecting us to listen from within context. Two things struck me then: one, that I knew this tone already and two, that it was something to record. It would teach us things, of people’s lived experience, that dramatisation could not. I began to meet with Commodore Boyagoda, two mornings a week at my home. This is how it worked: Commodore Boyagoda arrived and rang the doorbell. I let him in. He sat down at the dining table while I made coffee in the kitchen. I returned, poured the coffee and switched on a voice recorder. I would remind him at what point in the story we last stopped, sometimes ask a question and he would talk. After about an hour and a half, we would conclude the session – usually with my suggesting we’d probably talked enough for that day. Occasionally, at that point, we would briefly discuss the present; the political climate or other weather. Then I would walk Commodore Boyagoda back down the stairs to the door. With some long breaks we followed this routine for three and a half years. How Commodore Boyagoda felt about these meetings I don’t actually know. You must understand that the spare voice in which we tell his story in the book is much like the one in which we spoke. Nothing is being concealed from you – rather I have striven not to add to this story any sense of significance that Commodore Boyagoda himself did not give it. He told the story plainly and it took me a long time to be familiar enough with his voice to catch the nuances in it. I was trained, by working in the theatre, to trust in the value of repetition. The commodore told me his story many times. The first time, I tried not to interrupt his account, but simply to receive the story. That stage took about a year. Then we went over certain episodes. I would ask some questions and the commodore would give his account again. There are a few pivotal moments in the story that we discussed many times, while I listened for variations, distillations, emotional truth. One of the most instructive recognitions for me as I listened to the commodore was to realise how much he had in fact forgotten. “It was a long time ago,” he said. At first, I found this a little surprising. Commodore Boyagoda had been through the extraordinary experience of being a prisoner – how could he have forgotten any of it? Was he suppressing something? But later I began to take it as a reminder that perhaps it is not possible to live through an experience like this, while thinking it extraordinary. I did not wish to interrogate the commodore – that was not right. It felt important to me that I respect his privacy – and I suspect at another level I was also protecting my own. It simply felt like we had as much conversation as we could. Later on, I asked the commodore if he would have told the story differently to someone else – for example a military man of his own age rather than a civilian woman young enough to be his daughter. He said he told the story the same way always, and there was a force to the way he said this. I have come to understand that Commodore Boyagoda has decided the terms on which we should know his story. There is something about that I can only respect. My instinct was to trust Commodore Boyagoda, because I did and because it was the only fair way in which to work with him and re-tell his story. Yet, I also remember the early anxiety of working on a project about which I had only instincts, no certainty. I worried about how to win the Commodore’s trust when there would, for a long time, be no signs of progress. I felt the exercise would be a failure if it was painful to him or I lost his trust. The political climate in Sri Lanka when we started working in late 2010 was also very different, you will recall. Was I going to be complicit in creating a new risk to Commodore Boyagoda? Was I going to expose my own family to unnecessary scrutiny? At the very least, we were not sure we would be able to finish what we had started. But deeper than all these reservations, I had been schooled to test knowledge and to question what I was told. What did I really know of the war anyway? How could I verify the commodore’s account? I told myself it was important to ask these questions. I believed it would naturally strengthen the book to have it tested in this way. One of the areas in which this conflict played itself out was over the question of collaboration. Rumours had abounded that Commodore Boyagoda collaborated with the Tigers. He told me about these rumours. I asked him for his account – his account was always the same. He said he always answered the questions asked but knew he was not giving the Tigers privileged information. He was not privy to official secrets himself so he had none to tell, he said. I believed him. But I came back to it many times. I played the devil’s advocate with myself, asking fierce questions in capital letters in my notebook. I remember the shame I felt when one day the questions in my notebook caught Commodore Boyagoda’s eye. I realised that in my need to be accountable to other people, I could fail the man with whom I was working. I tried to have honest conversations with myself. To me, personally, there was no national question. With the benefit of hindsight, I saw nationalism as an unfortunate ideology through which to have approached our problems in Sri Lanka – both Sinhala nationalism and Tamil nationalism. I told myself it didn’t matter to me whether Commodore Boyagoda collaborated with the LTTE; that in a hundred years’ time we would allow the smaller complicities of small men trying to survive a war. But then something happened to question my confidence. Commodore Boyagoda received a call from a former LTTE cadre who had been one of the first people to interrogate him. This man told him that while working in the LTTE’s intelligence operation he had also been passing information on the LTTE to India’s intelligence body, RAW. RAW had blackmailed him into service, he said, threatening to expose a love affair that was forbidden under LTTE rules. Later he had, out of a different necessity, become an intelligence agent on behalf of the Sri Lankan army. Commodore Boyagoda was amazed by this information, just as he was to receive the call in the first place. The man had found him on Facebook. He said that Commodore Boyagoda had been an important part of his story and that he wanted to thank him. He wanted to send him a manuscript to read in which he recounted his own story. Commodore Boyagoda didn’t read it but he emailed the manuscript to me. It took me a long time to open it. The man had not intended me to read it, nor known the commodore was working on a book of his own. But again I made Cartesian arguments against my scruples and, at least, ran a search on the name Boyagoda throughout that manuscript. What I found was Commodore Boyagoda characterised as the traitor from whom this man had learnt to be a traitor. Despite my earlier confidence, despite what seemed like a very unreliable narrative, I was a little shaken by the suggestion. I realised then that it did matter to me – not that Commodore Boyagoda remain true to the Sri Lankan government’s cause but simply that he should not be duplicitous. I did not want him to have lied to me and I did not want him to have lied to the world. I put the question to him again. Gradually, I understood – from this episode as well as simply through the passing of more time, thought and conversation – that my schooled mistrust would do more to limit the book than to deepen it. I was not going to be able absolutely to verify stories, any more than I could absolutely anticipate the reaction of the establishment (by which I mean any of the establishments). Not only the commodore, but I too had to take some risk. I could be proved right or wrong. There were no safeguards. Even the knowledge I did gather was incomplete and could not in the end prove a better measure than instinct. With these realisations, I abandoned my earlier plans to talk to the commodore’s cellmate or anyone else with that sort of proximity to his story. What I felt most sensibly now was the sense of obligation that such conversations would bring – if those people made time to tell me their stories, it would only be fair that I tell their stories in the book. Serving them all partially, I would have to take charge of the narrative in a different way. I could demonstrate my own ingenuity in discovering a supposedly objective ‘truth’, but I would cease to tell the Commodore’s story. And I was more interested in his voice than my own; I was sure the reader would be too. I began by reading his letters from his sons. To read the letters of a woman to her husband in captivity was an intrusion to which I had to come round slowly. But it turned out also to be painful to read the letters of the children to their father. To see the tentative handwriting of an eight- and nine-year-old (the youngest being, at the time, still too small to write) was an initial shock. They asked their father if his ship was still broken? They asked if he couldn’t ask the “LTTE uncles” to let him come home. Gradually, they grew up and their letters knew more. Sometimes they revealed their troubles, sometimes they hid them. It was from the changes in the commodore’s sons that I really learnt what a long time eight years is. The most heart-breaking aspect of the job was to read the sensitive observations of the commodore’s middle son, who confided in his father that his mother said she was fine, but she was not. It was immensely difficult to read those letters, knowing this feeling child had been killed in a senseless accident less than a decade after his father’s return home. But these things did not go in the book. The story I re-told, as I had heard it, was the one the commodore recounted, its strengths and weaknesses intact. “And if it turns out you were mistaken?” someone asked. I’m not going to like it, I said. To write, I listened to the recordings I had made of my conversations with Commodore Boyagoda. While listening I made notes of the elements that had to be included; these notes formed the basis of the document I turned into sentences. Moreover, I felt it was by listening again and again to the way Commodore Boyagoda spoke – the rhythms of his speech – that I caught his meaning. Needless to say, it took this much listening – to perhaps 200 hours of conversation – before I felt I could write in the commodore’s voice. While I wrote I talked less to the commodore and more to other people. While Commodore Boyagoda had been confined to a single cell in each location, there had been many more people beyond those walls living the daily realities and difficulties of war. I wanted to hold them in my mind even as I wrote the commodore’s particular story. I don’t begin to suggest that I did extensive research. I went on road trips, to parts of the country where the commodore had been held, changed though these landscapes might be since the time he had known them. I usually travelled with my parents, not only for their willing and excellent company but also so we might look like an innocuous family party at a time when the authorities were suspicious of any sort of observation or investigation. I have to say that the soldiers we met on beaches were rarely taken in – looking past my parents, they would ask why I was there, what it was I did for a living? More crucially, I simply talked to friends; mostly those who lived in and around Jaffna town throughout the years of war – Jaffna, simply because it is the only place where the Commodore was held where I also know people. Behind these conversations, naturally, were other conversations I have had in other places in the course of life, and the experience of growing up in Sri Lanka in the ’80s and ’90s. My memory of the war in Sri Lanka starts with a return to the island in 1984 and a recurring conversation my parents had with their friends – some of whom were then choosing reluctantly to emigrate. It was a conversation about something terrible that had happened the previous year. They never mentioned what the thing was; between themselves they didn’t need to. I was five years old then and couldn’t work it out. I don’t remember when it was explained to me what these friends had faced in July 1983 and how they might never feel safe again; I only know that soon afterwards the understanding was implicit. Indeed, I grew up with this pattern of knowledge – to know increasingly difficult things, without shock, without moments of revelation. I made successive trips to Jaffna throughout the year 2013 so that conversations might unfold naturally, aware too that I did not wish to mine people for accounts of personal and sometimes painful experiences. I simply told my friends what I was working on. The effect of doing that was extraordinary. The project was not only received universally with interest, but with a kind of vindication and relief. People seemed to suggest that here was a clearing in the forest where we might talk about the war in a subtler way. I was relieved in turn, and enormously encouraged by this response, although it redoubled the sense of responsibility I felt. You see, the people I talked to were also the people to whom I felt myself accountable. I wrote this book most immediately, I suspect, for people like myself – who feel a burden of grief and responsibility for the Sri Lankan war. People who never did enough, understood enough. My parents’ generation saw this war begin; my generation lived its full course – I don’t believe it will be any of us who pull this island fully out of its mire. I believe we will tend it all our lives – as we must – if only so the generations that follow us can do much better than we did. If anything, this book is one small trace among tens of thousands that we hope will help them piece together a picture of what they’ve inherited. But to be truthful, I cannot yet imagine that generation. If I held myself accountable to anyone, it was to another set of people – the people who felt this war much more deeply than I did, because of where they were and who they were and what they chose to do or what they had to do. Yes, I do mean those people who are culturally or ethnically Tamil – that is an important aspect of experiences I cannot speak for – but I don’t only mean them. All this was said with an irredeemable bitterness – there was no real ‘better’ in the reality my friend described. But mostly he told me stories. I listened and he talked. He talked to connect to the things I told him about from Commodore Boyagoda’s account, and then he talked just to connect things. He told me stories from his own childhood. A little older than I am, he would have been a young teenager when the war got going. I wish I could replay for you the force and beauty of his account in which he used symbols – a set of coloured towels – to convey much more than either of us could put into words. I remember a conversation I had in a car with a friend, while her husband was refilling the tank at a brand new post-war petrol station on a newly widened junction of roads. My friend told me how she and her brothers had inherited their parents’ perspective on the war. Her parents were of the generation that believed in the new country after the British, she said. They began by blaming the LTTE for everything bad that happened and so they had to hold that line for decades. She and her brothers had to grow up before they could take a more complex view. Sitting in her garden at dusk, she traced for me in the sand the LTTE camp that had occupied her neighbourhood. She remembered that the cadre in charge was tall and good-looking and missing a leg. We both wished he might be Sridharan from the Commodore’s story, but it seemed unlikely. We talked while she cooked – I listened to the stories she told but I also watched the way she caught each preparation before it would spoil, turning it into something else that would keep. Although she now had a fridge, she was more accustomed to managing without one, after years of blackout during the war. More than once I asked myself whether I had discovered the true reason why I was writing this book with Commodore Boyagoda – that it would be an opening to other conversations. I had begun this project on an instinct and here I was being shown the meaning of that instinct. I struggled with a wish to share those encounters with friends. It felt wrong that the writer of the book should have the best experience of it. Yet I did not have permission to share those stories. I never asked for it; the conversations were not set up that way. I suspect that if I had asked for stories that I could put in a book I would not have got any. All I can hope is that this book will be another spur to readers to have conversations of their own. Indeed, this book is emerging at a time when those conversations are much easier to imagine. When we started working on the book in 2010 it felt that we in Sri Lanka lived in a kind of shocked silence. Yet even before the recent political changes, around the middle of 2013, I noticed that the language in which we talked about the war was beginning to change. In the beginning, few people said anything. There are always brasher voices to be heard but beneath them was a silence, a different silence to the one enforced by our rulers. In the south, the phrases ‘during the war’ or ‘since the war’ came quicker, not surprisingly. They were difficult to relate to, even to those of us who had lived more apart from the war. The way the war ended made it difficult to relate to. But it was also difficult simply to conceive of an end to the war, when the war had been there for 26 years and the conflict was still there. I have one memory of picking yellow flowers outside our childhood home that, if I think about it now, predates the war; that is all. Then, in 2013, I began to hear friends in the north and east begin to use those phrases, but with a different quality. It seemed not to mean ‘now that is over’ (as it sometimes did in the south) but ‘in that phase’ or ‘in this phase’. I began to notice people recounting their lives as stories. We have yet to see how far this goes; what histories it turns out we tell. For these are testimonies. We have in Sri Lanka, as elsewhere, a more sinister vein of ‘storification’ in which testimony is sometimes removed from lived experience and displaced to other realms. We speak in the language of mythology and of art – an idiom too important to be used euphemistically in this way – because it is easier to talk of a woman who doesn’t know what happened to her son as a woman with a ‘story’. Art is not here to be instrumentalised, to make experience easier to consume (easy for those who don’t relate to it, alienating for those who do) along with a good glass of wine. But we are not impartial – I would not even wish that we were. The ways in which we tell and receive these accounts are inevitably personal. So too the contents of this book are personal: for Commodore Boyagoda, for myself, for those whose voices are not heard in it and for many of our readers. Alongside the lives told are always lives lived, lives lost. Let’s not forget most histories don’t make it into book form – often not into words at all. Sunila Galappatti has worked with other people to tell their stories, as a dramaturg, theatre director and editor. She lives in Sri Lanka and A Long Watch is her first book.